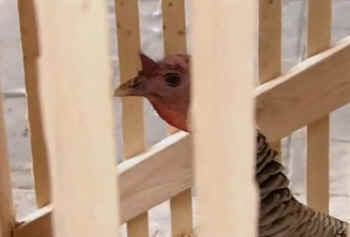 Back in April it looked like the Douglas County District Attorney’s office, in Lawrence, Kansas, was about to announce a decision whether to prosecute the Beta Theta Pi fraternity members at The University of Kansas who tortured this female turkey to death at a party on Friday night December 14, 2012. This photo shows her at the fraternity house shortly before the fraternity “men,” who “rented” her for the occasion, kicked in the crate and proceeded to chase her, throw her like a football, carry her upside down by her feet, squeeze her throat, and choke her by the neck. Eyewitnesses said her wing snapped, then her leg snapped, and she began screaming. An eyewitness watched as a fraternity member shook her violently by her neck until she died on the front porch of the fraternity house. Meanwhile, the Beta Theta Pi General Fraternity conducted its own investigation and announced a policy prohibiting live animals at any future fraternity events. Beyond this, despite promises, nothing is certain. University of Kansas Chancellor Bernadette Gray-Little sent a bland letter to people who wrote to her urging enactment of strict policies against animal abuse by all university residents. Unfortunately, institutionalized animal experimentation is legally protected, and farmed animals and birds have no protection under the Animal Welfare Act. However, wanton acts of animal cruelty, as in this case, are illegal in Kansas and in other states. For more information please see www.upc-online.org/entertainment on UPC's website.